JazzTimes reader Girish Trivedi, of Mumbai, India, sent in some recently discovered photographs of Louis Armstrong performing in Italy. Below are Trivedi’s memories of that concert and a meditation on Armstrong’s legacy. 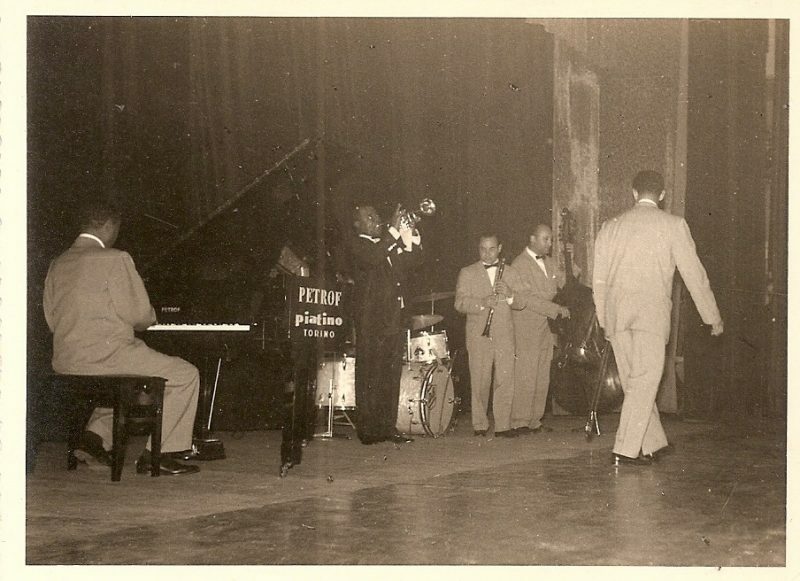 I recently found two pictures of the Louis Armstrong Sextet that I had taken from the audience on my Brownie, of a live concert that took place at Teatro Alfieri in Turin, Italy, on May 1, 1959. 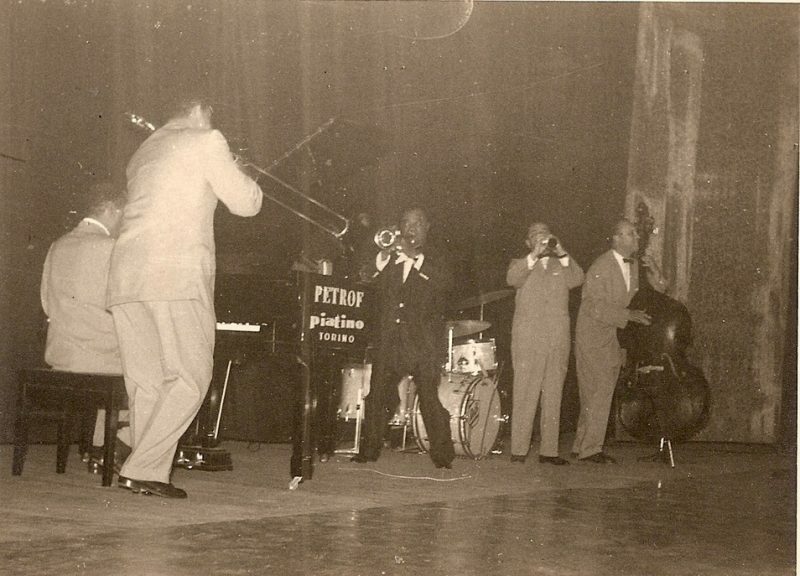 The group had Armstrong on trumpet, Trummy Young on trombone, Peanuts Hucko on clarinet, Arvell Shaw on bass, Billy Kyle on piano and Danny Barcelona on drums. A “jaded” Armstrong at 57 was electrifying, and the majestic tone of his trumpet was never in doubt. However, his playing did not equal his Hot Five and Seven sides, recorded in the ’20s. When Armstrong made his first trip to England, Nat Gonella, the English Dixieland trumpeter, was surprised to see Armstrong’s compact physical size, and wondered how such a small player could have such Herculean tone on the trumpet. Others examined Armstrong’s trumpet to see if there were any hidden devices that made his trumpet sound so loud and of mythical proportions in all registers. In later years, Satchmo was called an “Uncle Tom” by Miles Davis and some others; however, given the realities of the times, when African-Americans were brutally segregated, Armstrong had little choice but to play up to his white audiences and to his enterprising manager, Joe Glaser, who promoted him but also fleeced him. This was uncharitable of Davis and Armstrong’s other detractors. 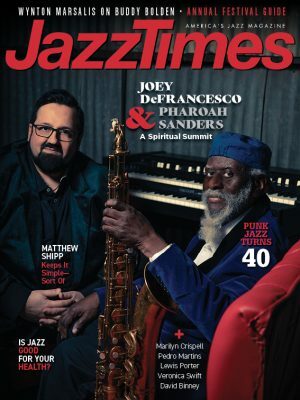 Before being exposed to Armstrong recordings in the early ’50s, I was already listening to hard-boppers Dizzy Gillespie, Clifford Brown, Howard McGhee, Fats Navarro and others. Later, when I witnessed Armstrong perform live, it opened up a whole new vista of the Dixieland- and Chicago-style playing of Bobby Hackett, Jimmy McPartland, Oran “Hot Lips” Page and swingers Bill Coleman, the Paris brothers and others. That said, it is quite clear that Roy Eldridge came out of Armstrong, Gillespie out of Eldridge and a whole host of trumpet players out of Gillespie. his ladies, his food and his reefer. It is a crying shame that even though he toured extensively all over the world, Armstrong at his death left behind a piddly estate of a little over a half a million dollars, including his house in Corona, Queens, New York. In my opinion, Armstrong invented jazz trumpet-playing and was the greatest granddaddy of them all, inventive, noble and soulful.